Before :- G.S. Singhvi and Mehtab Singh Gill, JJ. For the Petitioner :- Mr. K.D.S. Hooda, Advocate. For the Respondents :- Mr. Parveen Chaudhary Goyal, Senior Central Govt. Standing Counsel with Mr. M.S. Guglani, Additional Central Govt. Standing Counsel. (i) High Court should not readily exercise its jurisdiction under Article 226 of Constitution for frustrating investigation of criminal cases, else social stability will be jeopardised. State of Haryana v. Ch. Bhajan Lal and others, 1991(1) RCR(Crl.) 383 : AIR 1992 SC 604. State of West Bengal v. Swapan Kumar Guha, AIR 1982 SC 949. Mushtaq Ahmad v. Mohd. Habibur Rehman Faizi and others, 1996 SCC (Cri) 443. State of Bihar v. Rajindra Agrawalla, Criminal Appeal No. 66 of 1996 decided on 18.1.1996. Rajesh Bajaj v. State of NCT of Delhi and others, 1999 Cri.L.J. 1833. State of Himachal Pradesh v. Shri Pirthi Chand and another, 1996(2) RCR(Crl.) 759 : JT 1995(9) SC 411. State of U.P. v. O.P. Sharma, 1996(7) SCC 705. Rashmi Kumar (Smt.) v. Mahesh Kumar Bhada, 1997(2) SCC 397. State of Kerala v. O.C. Kuttan and others, 1999 SCC (Cri) 304 : 1999(1) RCR(Crl.) 831. G.S. Singhvi, J. - This petition has been filed for quashing of F.I.R. No. 63 dated 25.7.1998 (Annexure P.5) registered at Police Station, North Chandigarh, on the basis of complaint made by the Protector of Emigrants, Chandigarh in which it has been alleged that by issuing advertisement (Annexure P-1), the petitioner has violated sections 10 and 16 of the Emigration Act, 1983 (hereinafter referred to as 'the Act'). 2. Shri K.D.S. Hooda, submitted that in view of the order dated 10.8.1998 passed by this Court in C.W.P. No. 12016 of 1998 Sunrise Immigration Consultancy (P) Ltd. v. Union of India and others, the first information report registered against the petitioner should be quashed. He pointed out that in the enquiry conducted by Shri Bhagwan, Sub Inspector, Economic Offences Wing, Chandigarh, no offence is found to have been committed by the petitioner. Learned Counsel took us through the contents of paragraph 9 of the writ petition to show that as per the report of Shri Bhagwan, the petitioner is doing consultancy business only and it is not engaged in business of recruitment. 4. Where the allegations in the F.I.R. do not constitute a cognizable offence but constitute only a non-cognizable offence, no investigation is permitted by a police officer without an order of a Magistrate as contemplated under Section 155(2) of the Code. We also give a notice of caution to the effect that the power of quashing a criminal proceeding should be exercised very sparingly and with circumspection and that too in the rarest of rare cases; that the Court will not be justified in embarking upon an enquiry as to the reliability or genuineness or otherwise of the allegations made in the F.I.R. or the complaint and that the extra- ordinary or inherent powers do not confer an arbitrary jurisdiction on the Court to act according to its whim or caprice. "The classic exposition of the law is found in State of West Bengal and others v. Swapan Kumar Guha, AIR 1982 SC 949 (cited above). In this case, Chandrachud, CJ. in his concurring separate judgment has stated that "if the FIR does not disclose the commission of a cognizable offence, the Court would be justified in quashing the investigation on the basis of the information as laid or received". Justice A.P. Sen who wrote the main judgment in that case with which Chandrachud, CJ. and Varadarajan, J. agreed had laid the legal proposition as follows : (at pp. 971 and 972 of AIR). ".....the legal position is well-settled. The legal position appears to be that if an offence is disclosed, the Court will not normally interfere with an investigation into the case and will permit investigation into the offence alleged to be completed; if, however, the materials do not disclose an offence, no investigation should normally be permitted............. Once an offence is disclosed, an investigation into the offence must necessarily follow in the interests of justice. If, however, no offence is disclosed, an investigation cannot be permitted, as any investigation, in the absence of any offence being disclosed, will result in unnecessary harassment to a party, whose liberty and property may be put to jeopardy for nothing. The liberty and property of any individual are sacred and sacrosanct and the Court zealously guards them and protects them. An investigation is carried on for the purpose of gathering necessary materials for establishing and proving an offence which is disclosed. When an offence is disclosed, a proper investigation in the interests of justice becomes necessary to collect materials for establishing the offence, and for bringing the offender to book. In the absence of a proper investigation in a case where an offence is disclosed, the offender may succeed in escaping from the consequences and the offender may go unpunished to the detriment of the cause of justice and the society at large. Justice requires that a person who commits an offence has to be brought to book and must be punished for the same. If the Court interferes with the proper investigation in a case where an offence has been disclosed, the offence will go unpunished to the serious detriment of the welfare of the society and the cause of justice suffers. It is on the basis of this principle that the Court normally does not interfere with the investigation of a case where an offence has been disclosed...."
Whether an offence has been disclosed or not must necessarily depends on the facts and circumstances of each particular case...... If on a consideration of the relevant materials, the Court is satisfied that an offence is disclosed, the Court will normally not interfere with the investigation into the offence and will generally allow the investigation into the offence to be completed for collecting materials for proving the offence." "In the complaint the appellant averred that he was a teacher of Madarsa Faiz-e-Am since the year 1974 and at the material time the respondents were the Manager, Principal, Teacher and Member of the Managing Committee of the school respectively. In the year 1985 he went on leave to get higher education in Saudi Arabia and after coming back from there in 1988 when he went to join the School he found that his salaries and dearness allowances for the above period had been drawn by them from the government funds and, by forging his signatures, purported payments thereof to him were shown. According to the complaint, the respondents had thereby committed breach of trust of government money. In support of the above allegations made in the complaint copies of the salary statements of the relevant periods were produced. In spite of the fact that the complaint and the documents annexed thereto clearly made out a prima facie case for cheating, breach of trust and forgery, the High Court proceeded to consider the version of the respondents given out in their petition filed under Section 482 Cr.P.C. vis-a-vis that of the appellant and entered into the debatable area of deciding which of the versions was true, - a course wholly impermissible in view of the above-quoted observations in the case of Bhajan Lal." "It has been held by this Court in several cases that the inherent power of the Court under Section 482 of the Code of Criminal Procedure should be very sparingly and cautiously used only when the Court comes to the conclusion that there would be manifest injustice or there would be abuse of the process of the Court, if such power is not exercised. So far as the order of cognizance by a Magistrate is concerned, the inherent power can be exercised when the allegations in the first information report or the complaint together with the other materials collected during investigation taken at their face value, do not constitute the offence alleged. At that stage it is not open for the Court either to shift (sift ?) the evidence or appreciate the evidence and come to the conclusion that no prima facie case is made out." "The crux of the postulate is the intention of the person who induces the victim of his representation and not the nature of the transaction which would become decisive in discerning whether there was commission of offence or not. The complainant has stated in the body of the complaint that he was induced to believe that respondent would honour payment on receipt of invoices, and that the complainant realised later that the intentions of the respondent were not clear. He also mentioned that respondent after receiving the goods have sold them to others and still he did not pay the money. Such averments would prima facie make out a case for investigation by the authorities. The High Court seems to have adopted a strictly hypertechnical approach and sieved the complaint through a cullender of finest gauzes for testing the ingredients under Section 415, IPC. Such an endeavour may be justified during trial, but certainly not during the stage of investigation. At any rate, it is too premature a stage for the High Court to step in and stall the investigation by declaring that it is a commercial transaction simpliciter wherein no semblance of criminal offence is involved." (ii) the power vested in the High Court under Section 482 of the Code of Criminal Procedure or Articles 226 and 227 of the Constitution of India should be exercised sparingly and cautiously and that too only when the Court is of the opinion that non-interference by it may result in gross miscarriage of justice. "Advertisement given by Sunrise Immigration Consultant (P) Ltd.
Our is a professional organisation. We offer unique policy. File your case now. Pay only when succeed and also no visa no fee. Canadian Immigration has now become very tough. Major Changes introduced in the Canadian Immigration Laws from Ist May, 1997. More changes expected shortly - Canada Gazette Part II Vol. 131 10 DT. 14th May, 1997. Canadian classification and dictionary of occupations has also been replaced. SUNRISE IMMIGRATION CONSULTANT (P) LTD.
FRANCHISEES/BUSINESS ASSOCIATES REQUIRED FOR CITIES IN PUNJAB/HARYANA/H.P. & J&K." "Advertisement Annexure P.1 given by the petitioner. May assist you in preparing Immig. papers, arranging accommodation and to send your job applications to your employers and getting your social security No./Insur. No./Driving Licence. We charge very nominal fee. (iv) getting social security number, insurance number and driving licence number by charging nominal fee. 11. 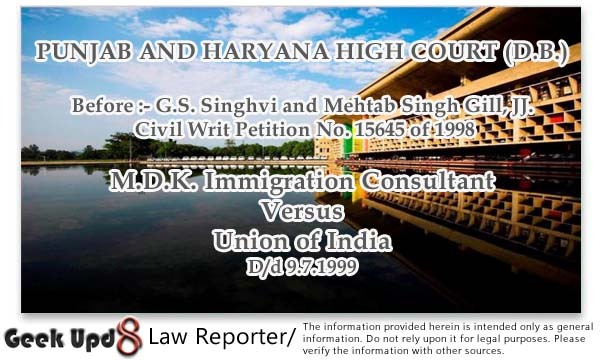 If the petitioner was merely giving consultation in the preparation of immigration papers and sending the job applications, as sought to be argued by Shri Hooda, there was no occasion for it to hold out promise to the prospective candidates that it will help them in arranging accommodation and getting social security number, insurance number and driving licence which are required only after getting employment in the foreign country. Learned counsel was at loss to explain the promise given to the prospective candidates that the petitioner would help them in getting post employment facilities. In our view, by reading the advertisement (Annexure P.1) any person of ordinary prudence will get attracted with the promise made by the petitioner regarding the post-employment facilities in a foreign country. Therefore, we are prima facie satisfied that the petitioner had given the advertisement as a recruiting agent. 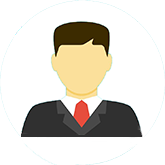 Section 10 of the Act prohibits any person from acting as a recruiting agent without a valid certificate and in view of the admitted fact that the petitioner does not possess such certificate, it will be deemed to have issued the advertisement in contravention of Section 10 of the Act. We, therefore, do not find any valid ground for the Court's interference at this stage of the investigation. In our view, interference by the Court in a case of this nature will prove to be socially counter-productive and will encourage illegal immigration of Indian citizens. It will also lead to fleecing of innocent people who are lured with the prospects of job in foreign countries. The order Annexure P.7 passed in the case of Sunrise Immigration Consultant (P) Ltd. cannot be of any help to the petitioner because that order appears to have been passed on the basis of concessional statement made by the counsel appearing for the Union of India. Such an order, in our considered view, cannot be made basis for quashing the first information report registered against the petitioner. 12. Before parting with the case, we may take judicial notice of the widespread malaise of illegal immigration and the exploitation of young ones by unauthorised recruiting agents. Judicial notice can also be taken of the tragedy which occurred on the night intervening 24th and 25th November, 1996 in which 280 immigrants including 170 Indians, who were being illegally ferried met their watery graves on their journey from Malta to Cicily. 13. For the reasons mentioned above, the writ petition is dismissed.